Knit a scarf in under an hour by using super-ultra-chunky yarn, large needles, and this Natascha scarf pattern. Even new knitters can knit this scarf in under an hour if you concentrate. Gauge: Unimportant. As knitted here from unspun spinning fiber, the gauge is approximately 1 stitch per 1 inch. Cast on 8 stitches (sts) and knit, wrapping yarn around your needle twice. When you knit the next row, the extra wrap will drop from your needle and make the row twice as high as it would normally be. Continue knitting this way until piece measures 15 to 17 inches. 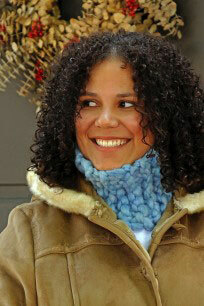 Or until it’s large enough to wrap around your neck snugly, but not too tightly. Bind off and seam the ends together.